We have carved a niche amongst the most dominant names in this domain, engaged in offering PP Ring Binder. Our reputed entity is engaged in supplying PP ring binder. We make the best View Binders in the entire industry. They are made from high quality Polypropylene sheets.These binders conform to international standards and are a product to reckon with and to be proud of. The binders have front top view clear pocket and an inner half pocket for display of the documents. 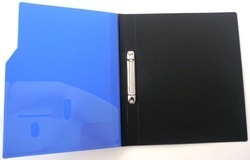 Eco ranges of PP binders with 2-O & 2-D style rings. Simple yet functional.